The Mystic M4200 offers an additional fishing package. The Mystic M4200 features a hull and deck that are epoxy infused and fully foam cored with e-glass laminates and carbon fiber reinforcements. She’s available with triple or quad Mercury and Mercury Racing outboards, and tops out at more than 80 mph. The large center console has a spacious queen cabin below and seating for three across the helm. The dash on the Mystic M4200 can accommodate two 24-inch multi-function displays, and a CZone digital switching system comes standard. A recreational fishing package is available on the Mystic M4200. That includes a livewell and fish boxes with macerator pumps and rod holders. 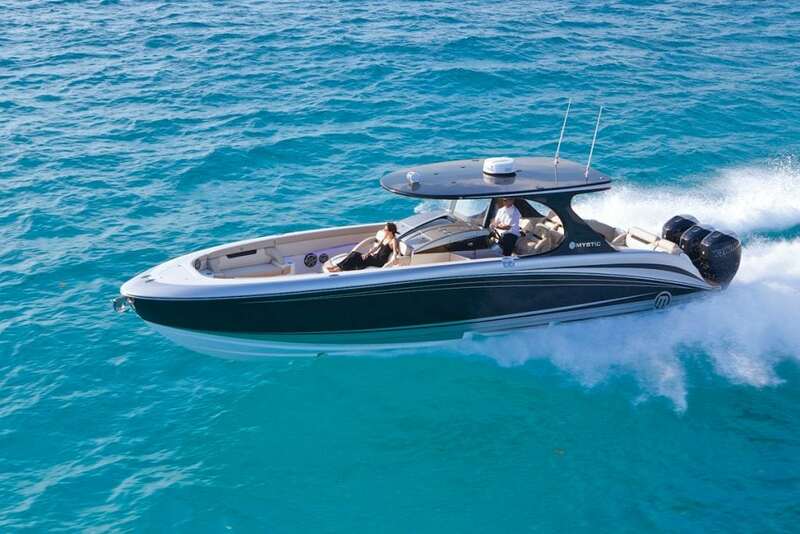 With a deep freeboard of up to 38 inches, the boat is very dry in rough conditions and gives the owner and guests a great feeling of security. Gunwale wind doors protect the aft cockpit area on windy, wet and cool days. All seating material and heights are configured for comfort, while 45- to 70-pound density foams offer support.